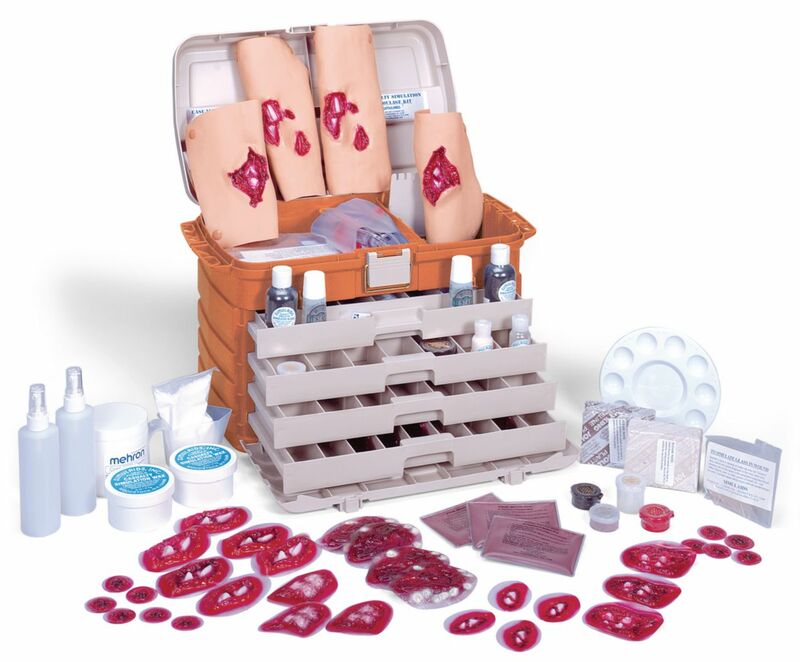 This casualty simulation kit is especially suitable for use in the creation a disaster scenario where application of makeup on multiple casualties creates the widest range of wounds. This kit contains specialty wounds associated with gunshots, like perforations, major avulsions, complex jaw wounds and also a large supply of makeup components. The medical emergency simulation kit is supplied in a storage case and includes Bleeding wounds (complete with reservoir bags with pump assembly): 2 compound fractures of humerus; 2 compound fractures of tibia. Non bleeding wounds: 60 assorted stick-on lacerations and open fracture wounds. Makeup Accessories include 1 Makeup palette; 1 scissors; 1 mirror; 1 measuring cup; 2 atomizer mist sprayer; 2 casualty simulation wax; 2 bottles coagulant Makeup blood; 3 pkg. blood powder, each for 4.5 liter simulated blood; 2 pkg. broken Plexiglas® for simulating glass embedded wound; 2 fake dirt; 2 each Makeup Liners: red, blue, brown, white, yellow, black and flesh; 2 plasticine modeling paste: white and dark; 1 glycerine for simulating perspiration; 1 cold cream; 1 mineral oil; 1 charcoal; 3 latex compound to simulate scars; 2 petroleum jelly; 2 pressure sensitive tape; 1 pkg. methyl cellulose for blood thickening; 2 body adhesive for stick-on wounds; 6 spatulas; 6 tongue depressors;10 cotton balls; 10 cotton applicators/swab sticks; 1 pkg. of tissues; and 6 Makeup sponges.